As a child, Marjane finds much comfort in God, who becomes a friend as well as a source of support. However, as the world around Marjane becomes uglier and uglier, and as she comes to understand that much of this ugliness is a result of the hardline religious leaders who now run the Islamic Republic, she begins to move herself away emotionally from God, and she finally banishes him from her life after she sees Anoosh in jail and knows he will soon be executed. 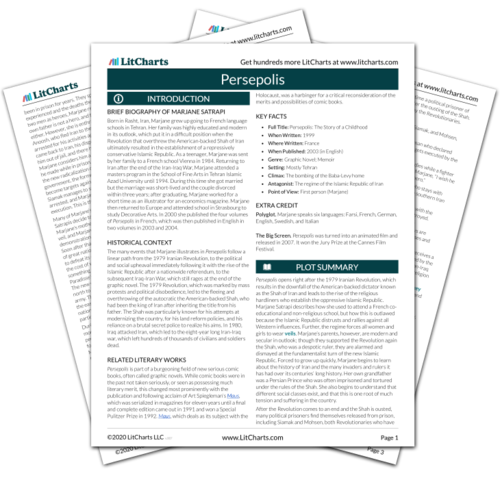 The timeline below shows where the character God appears in Persepolis. The colored dots and icons indicate which themes are associated with that appearance. Goldman, Ben. "Persepolis Characters: God." LitCharts. LitCharts LLC, 26 Aug 2015. Web. 24 Apr 2019. Goldman, Ben. "Persepolis Characters: God." LitCharts LLC, August 26, 2015. Retrieved April 24, 2019. https://www.litcharts.com/lit/persepolis/characters/god.